The Bouckaert et al. article in Science that claims to “solve” a “long-standing problem in archaeology— the origin of the Indo-European family of languages,—also purport to supply novel quantitative evidence for the Anatolian hypothesis, which locates the Indo-European homeland in what is now the Asian part of Turkey. 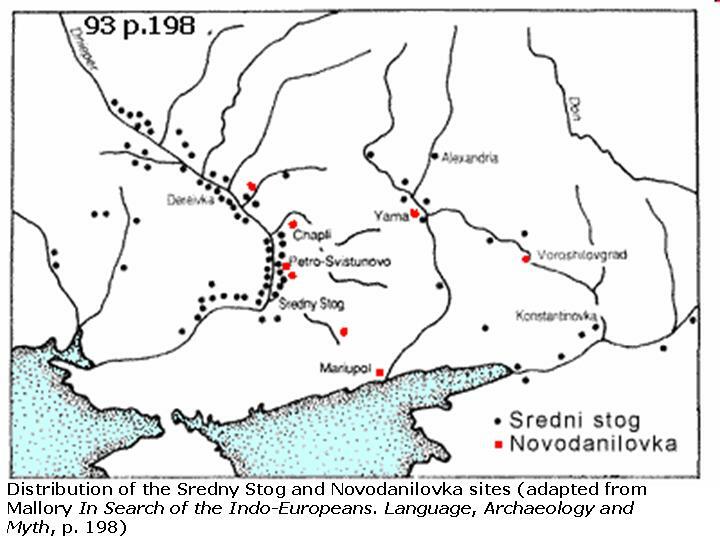 The authors also claim to refute the more commonly adopted Kurgan theory, which places the Indo-European homeland in the Pontic-Caspian steppes of southern Russia and eastern Ukraine. The two theories differ not only on where the Indo-European homeland was located, but also on when Proto-Indo-European (PIE) split into daughter languages: the Anatolian hypothesis dates the division to 8,000-9,000 years ago (or 6,000-7,000 BCE), while the Kurgan hypothesis provides a much later date, 5,000-6,000 years ago (or 3,000-4,000 BCE). Thus, both “where” and “when” questions constitute the problem of Indo-European origins. Bouckaert et al.’s supposed contribution consists of comparing (existing) lists of cognates for 207 meanings in 103 contemporary and ancient Indo-European languages (5047 cognate sets in total). Based on a calculation of shared cognates, their computational algorithms produce a phylogenetic* tree representing how these 103 languages are related to each other; each split on the tree is dated first in relative and then in absolute terms. Bouckaert et al. also map the resulting tree, creating an animated visualization of how these linguistic lineages supposedly split off from each other and spread across the landscape. Separate posts will focus on problematic aspects of the Indo-European tree produced by Bouckaert et al. 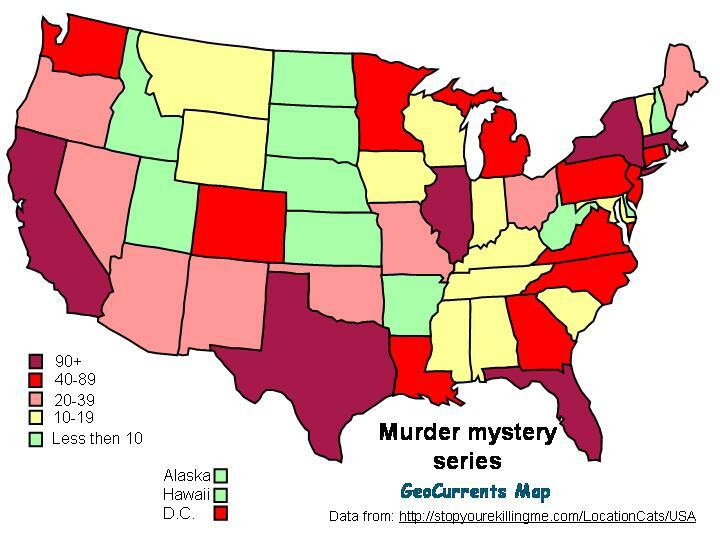 (including the dates of the various splits), examining as well the geographical blunders made in placing them on the map; here, we will consider problems arising from the underlying methodology of counting shared cognates. Since the concept of “cognates” lies at the core of Bouckaert et al.’s methodology, it is imperative to define the term precisely before we proceed with our critique. As mentioned in an earlier post, cognates are not just words of similar meaning that sound alike, such as the English bad and the Persian bad, which mean roughly the same thing. According to the definition adopted in historical linguistics, cognates are words whose similarity of sound and meaning is due to common descent rather than lexical borrowing or sheer accident (as in the case of bad above). Crucially, cognates are often similar but not exactly the same in sound, and are often not the same in meaning either. Yet the differences in sound and meaning can be explained through regular phonological and semantic changes. One example of cognates, still easily recognizable, are the English word knight and the German Knecht (discussed in detail in Pereltsvaig 2012). The differences in sound is accounted for by the disappearance in English of /x/ (spelled as gh, as in in bough and many other words), the simplification of the word-initial consonant cluster /kn/ through the deletion of /k/ (also in knee, knife, and so on), and the Great Vowel Shift, which changed the [i:] into [aj]. The spelling of knight represents the Old English pronunciation of this word, [knixt], which is much closer to that of the German Knecht. Importantly, the meanings of the English and the German words diverged as well, undergoing commonplace processes. Specifically, the English word underwent a great upward mobility during the Middle Ages (known in technical lingo as “melioration”) and became associated with the aristocracy, while its German cognate retained the humble meaning of ‘servant’. In some instances, cognates are not apparent to the naked eye; as the eminent Russian linguist Andrey Zaliznyak once quipped, if two words look exactly the same, they are in all likelihood not cognates. Since each sound in a word may have undergone an independent change, cognates can bear no immediate resemblance to each other in sound. Based on heaps of data amassed over the last 200 years, historical linguists have worked out principles and procedures for identifying cognates, which rely on an understanding of what types of linguistic changes are likely to happen and what types are not. For example, words often change its meaning from a part to the whole, as in All hands on deck!, which calls for entire sailors, not just their hands; the reverse change is much less common. Similarly, a k sound is likely to change into a ch or sh sound (the initial sounds of chair and share, respectively), but not into a p or an n sound. Also, not all words that resemble each other in form and meaning are cognates. Both borrowings and accidental look-alikes, like the English and Persian words bad mentioned above, are not cognates in the technical sense. Most research that compares lexical items across languages on a massive scale, like that of Bouckaert et al., wean out items that are accidentally similar. Bouckaert et al. excluded “known borrowings such as English mountain acquired from French montagne” (according to their explanation in the Supplementary Materials, p. 1). 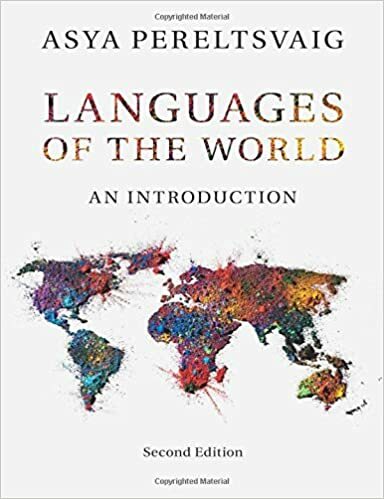 Computational methods exist that allow much more thorough identification of loanwords, without “individual linguists scanning through lists on the basis of considerable knowledge of the histories of the languages concerned” (McMahon 2010, p. 132). Essentially, such algorithms produce hundreds of possible phylogenetic trees, selecting the ones that show the fewest discrepancies with the data, and then identifying lexical items “which are persistently discordant with the better trees” (McMahon 2010, p. 133). In other words, borrowings stand out as items that do not fit with the otherwise optimal branching patterns. A more specific method of identifying loanwords—and even dating the time of borrowing—revolves around examining traces of phonological changes known to have happened in either the source or the target language. For example, the words candle and chandelier both derive from the same Latin source: candela meaning ‘a light, torch, candle made of tallow or wax’. However, the two words were borrowed into English at different times: candle during the Old English period and chandelier in the late Middle English period (late 1300s). The different timing is signaled by the fact that chandelier is pronounced with a sh rather than a k sound, reflecting a sound-shift in Old French, from which the word penetrated into English. It appears that Bouckaert et al. did not apply either of these powerful methods for identifying cognates, and instead merely relied on pre-existing lists (though they are unclear on the subject). As we shall see in a later post, misidentifying loanwords as cognates can throw off the phylogenetic tree; and we shall see below that being able to separate loanwords and cognates is crucial for solving the “wheel” problem that confronts the Anatolian hypothesis. As mentioned above, Bouckaert et al. rely on a quantitative analysis of Indo-European vocabulary lists, but historical linguists have long understood that a qualitative analysis is often necessary for determining where a proto-language must have been spoken. 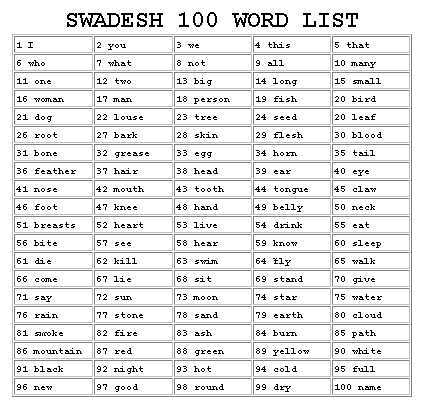 Most items in the classical 100-word Swadesh list—which includes such basic concepts as ‘I’, ‘mother’, ‘heart’, and ‘die’—are universal, and hence are of no use for figuring out past geographical patterns. 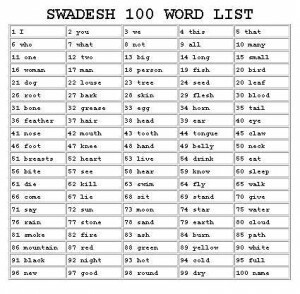 Less common meanings that are not included in the Swadesh list, however, can provide strong indications of both where and when an ancestral tongue was spoken. One set of words shedding crucial light on the problem of the Indo-European origins pertains to ‘wheel’ and related vehicular items, discussed extensively in chapters 2 and 4 of David W. Anthony’s The Horse, The Wheel, and Language. All told, these vocabulary items tilt the balance towards the Kurgan hypothesis, presenting an insurmountable problem for the Anatolian alternative. Here is the problem in a nutshell. Reconstructions of PIE include the word *kwekwlos for ‘wheel’ (an asterisk in front of PIE and other forms indicate that these forms are reconstructed and not attested in written documents). However, archeological evidence indicates that wheels and wheeled vehicles first appeared about 4,000-3,500 BCE, a timeframe consistent with the Kurgan theory but not with the Anatolian hypothesis. If PIE split earlier than the appearance of a wheel, why do its descendant languages have these cognates? Or if PIE is 3,000 years older, as Bouckaert et al. argue, why is there no archaeological trace of wheeled transport for this three-millennium span? they were created in the various Indo-European branches independently, also after PIE split had occurred (compatible with the Anatolian theory). Unfortunately for Bouckaert et al, the latter two scenarios—the only ones compatible with the Anatolian theory that.they advocate—are not compatible with linguistic evidence. As pointed out by Anthony, “almost all the terms are derived from Proto-Indo-European roots, so the vocabulary for wagons and wheels was not imported from the outside but was created within the Proto-Indo-European speech community” (p. 64). It is extremely unlikely that the words could have spread from IE branch to branch by borrowing, as once the daughter languages split off, the resulting communities had virtually no contact with each other. For example, according to Bouckaert et al., the separation of Tocharian from the rest of the IE family occurred around 4800 BCE, yet Tocharian has all five wheel-related roots (cf. Anthony, p. 64). ** In his detailed discussion of PIE ‘wheel’ on LanguageLog, historical linguist Don Ringe suggests that based on linguistic evidence this separation “was sharp, and that [Tocharian] did not again come into contact with other IE languages (specifically, Iranian languages) for many centuries”. Geographically speaking, this makes sense: some 1,500 years after the speakers of Tocharian moved away from the PIE homeland, they were too far removed from the rest of the family for any contact to have been be feasible. In fact, Bouckaert et al.’s own animated map puts the front of advance of Tocharian speakers in the middle of Karakum desert in Turkmenistan, as can be seen from the map frame on the left, pertaining to 3300 BCE. Linguistic evidence also shows that the independent creation of similar looking ‘wheel’ words in at least four branches of Indo-European—Germanic, Iranian, Greek, and Tocharian—is highly improbable. The word *kwekwlos ‘wheel’ has a PIE etymology, deriving from another root in the language, namely *kwel- meaning ‘to turn’: a wheel, after all, is a “thing that turns” (the PIE *aks ‘axle’ derives from another reconstructed PIE word meaning ‘shoulder’). It is not impossible that separate language groups would make up their own words for ‘wheel’ based on the verb ‘to turn’, but “at least four different verbs meaning ‘turn’ or ‘roll’ or ‘revolve’ are reconstructed for Proto-Indo-European, which makes the repeated independent choice of *kwel- problematic” (Anthony, p. 78). Moreover, since the pattern of derivation from *kwel- ‘to turn’ to *kwékwlos ‘wheel’ is unusual (e.g. it involves reduplication), Ringe concludes that “this word is overwhelmingly unlikely to have been formed more than once”. In other words, while speakers of the various Indo-European languages may have reinvented the wheel, it is virtually impossible that they reinvented the word for it as well. That leaves us with only one alternative: the ‘wheel’ vocabulary originated in PIE prior to its split into daughter languages, which thus must have happened some time after 4000 BCE. For Bouckaert et al. to be historically correct, “you’d expect there’d be some pre-4000 BC chariots lying around elsewhere”, in the words of a LanguageHat reader YM. But there are not. Bouckaert et al. themselves do not address this problem in the article, and in media reports and blogosphere discussions individual authors appear to wave all such difficulties away without rebuttal. The ‘wheel’ problem is part of a larger issue: numerous other PIE words that can be reconstructed from cognates in descendant languages point to the geographic area where PIE speakers must have lived. This vocabulary includes words for trees like ‘beech’, ‘birch’, and ‘pine’, wild animals like ‘bear’, ‘wolf’, ‘deer’, ‘otter’, ‘lynx’, and ‘beaver’, as well as ‘horse’, ‘wool’, ‘sheep’, ‘goat’, ‘cow’, ‘pig’, ‘bee’, and ‘honey’. There are no reconstructed PIE words that would point in the direction of Mediterranean climate (no ‘cypress’, ‘olive’, or ‘laurel’) or a tropical one (no ‘monkey’, ‘elephant’, ‘palm’, ‘papyrus’, ‘coconut’, etc.). Such evidence strongly suggests a temperate-zone location, probably at the border of steppe lands and forests. 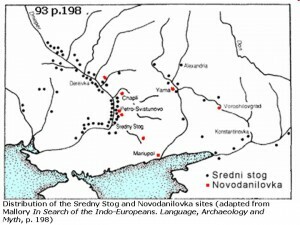 One area that fits the bill perfectly is the Ukrainian forest-steppe zone that was home to Sredny Stog culture, which was flourished from 4500-3500 BCE in the area just north of the Sea of Azov between the Dnieper and the Don rivers. Intriguingly, the earliest evidence of horse domestication comes from the later phase of the Sredny Stog culture, as does some evidence of woven textiles (discussed in chapter 4 of Anthony’s book). Another set of reconstructed PIE words that points in the same direction includes such weather and climate related terms as ‘cold’, ‘winter’, and ‘snow’: while Anatolia has some snow-covered peaks, the climatic fit is much better for the Ukrainian forest-steppe zone (see the map on the left). 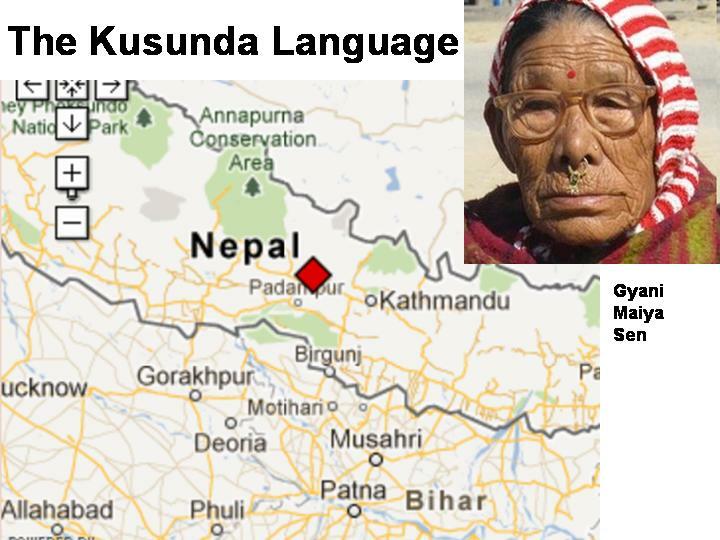 All in all, examining the meanings of words that can be reconstructed for PIE indicates a relatively northern location for the family’s homeland, compatible more with the Kurgan hypothesis than with the Anatolian one. Examining PIE vocabulary reveals another interesting point: PIE must have been in contact with another reconstructed proto-language, Proto-Uralic, as the latter contains words similar to their counterparts in Proto-Indo-European, such as *porćas ‘pig’ (cf. PIE *porkos). The presence of such shared vocabulary has been interpreted by some linguists as evidence for the existence of a combined Indo-Uralic language family, though most scholars take the opposite view and treat these items as loanwords from PIE into Proto-Uralic. But for such borrowing to have been possible, PIE must have been spoken in reasonable proximity to Proto-Uralic. The location of the Uralic homeland is also uncertain, with some scholars placing it in Western Siberia and others just to the west of the Ural Mountains. Among the latter group are those who associate Proto-Uralic with the Pit-Comb Ware culture situated to the north of the Kurgan culture in the 5th millennium BCE. In effect, the Kurgan hypothesis of the Indo-European origins and the European theory of Proto-Uralic homeland support each other. If PIE had been spoken in Asia Minor, as Bouckaert et al. claim, we find no traces of similar borrowings by its putative neighbors. * “Phylogeny” is a biological term that refers to the history of the lineages of species as they change and differentiate through evolutionary processes. **The word *kwekwlos in Tocharian changed its meaning from ‘wheel’ to ‘wagon’. But as pointed out above, such change from part to whole is not uncommon: for example, in present-day English to buy new wheels can denote a purchase of new tires or a whole car. Anthony, David W. (2007) The Horse, The Wheel, and Language. How Bronze Age Riders from the Eurasian Steppes Shaped the Modern World. Princeton University Press. McMahon, April (2010) “Computational Models and Language Contact”. In Raymond Hickey (ed.) The Handbook of Language Contact. Pp. 128–147. Wiley-Blackwell. 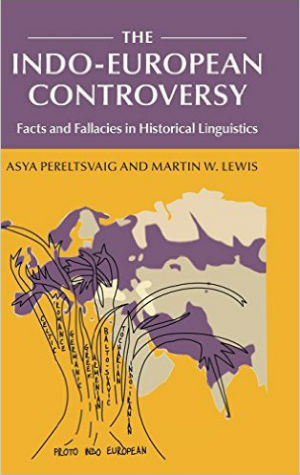 Pereltsvaig, Asya (2012) Languages of the World: An Introduction. Cambridge University Press.